After his father's death in 1848, Noah was seventeen and a ward of his sister and brother-in-law, Simeon and Isabella Hawkins. This is probably why he followed his sister Isabella to TN. Peter Hawkins moved his large family from Newberry Co., SC to Dyer Co., TN. Peter's son Simeon Hawkins and his wife Isabella, Noah's sister, moved along . Noah went along and moved in with Peter Hawkins and family. Although Noah is in Dyer Co in the 1850 census and the 1860 census, he apparently spent some time between in Tishomingo Co., MS. I don't know why he was there or how long, but it was less than 10 years. Noah joined the 47th Infantry Regiment of the Confederate Army at Trenton, TN in March of 1862. He joined with Simeon and Israel. His first conflict was the battle of Shiloh. He was reported later as deserting, but later evidence indicates that this, like for many others, was a mistake. We have a affidavit from an officer that he served most of the war.. In the early 1870's Noah moved to Bradford Co., FL (now Union Co.), near his brothers and sister. The move was made because of Nancy’s poor health. His three youngest children: Mary (Mollie), Rufus, and Noah, moved with them. The others had either died or remained in Dyer Co. They settled in the Providence Community. In 1876, Nancy died. She had been in ill health for a long period. The family continued in Bradford (Union) County with some moving to Columbia County. 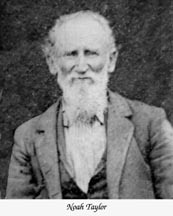 Noah died on 17 Jan 1900. Delia lived until 18 Feb 1928. They are buried in the cemetery of the Old Providence church in Bradford Co, FL, now Union County. Click on the small photo to see a larger image. The names in brackets [ ] give the generations. Please help identify persons below or correct my misidentifications. © 2002-2006 Miller Taylor. All Rights Reserved.